Present-day Ewe Hai Street, which connects to Carpenter Street. THE ebb and flow of people in and out of a city are like ocean waves sweeping across the face of a beach, leaving behind traces of distant places as they pick up other pieces to be brought to another faraway place if they so choose to travel on. This has power to permanently shape the face of the land over time, maybe even down to the bedrock upon which the land rests. So too it has been with the arrival of the early Chinese migrants from China — some by way of Kalimantan — onto the riverbanks of Kuching, etching their homeland cultures and practices onto the very heart and soul of the old city. 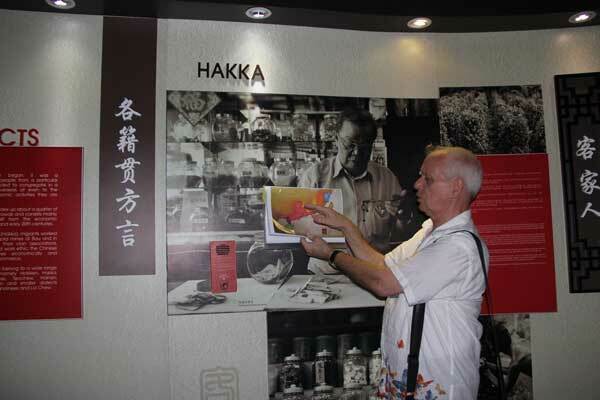 Sarawak Heritage Society (SHS) — a non-governmental organisation (NGO) committed to raising community awareness of the preservation of Sarawak’s culture and heritage — recently held a preview of a heritage walk ‘A Stroll Through Kuching’s Chinese History’ for members. The two-hour walk started at the Chinese History Museum and finished at Upper China Street with brief stops along Ewe Hai Street and Carpenter Street. Friends of Sarawak Museum (FOSM) volunteer heritage guide Paul Gerarts was the knowledgeable docent who guided the small but eager group of participants. FOSM is a membership-based NGO which seeks to promote the appreciation of Sarawak’s heritage through its museums and other heritage sites. Gerarts explains the migration route of the Hakkas from China to Sarawak. The Chinese History Museum presently occupies the former Chinese Chamber of Commerce building along the Waterfront just opposite the Tua Pek Kong temple. Built in 1912, it was here the Chinese Chamber of Commerce committee would adjudicate on civil disputes within the Chinese community. The Third Rajah of Sarawak Charles Vyner Brooke encouraged the community to govern itself. The museum provided a valuable overview of migration routes taken by many Chinese sub-ethnic groups from their respective home provinces in China to Sarawak, including the Hokkien, Hakka, Foochows, Cantonese, Teochews, Hainanese, Chao Anns, and Henghuas. Most came by sea while some like the Hakka arrived in Sarawak by way of Kalimantan. The museum also has displays of key Chinese community leaders, explaining how each sub-ethnic group brought with them their own peculiar way of life but adapted it to suit their needs and the local situation. When migrants set foot in Kuching, the first place many of them would visit was the nearest clan house or temple association where they would be welcomed and given food and lodging. Through contacts made through their clansmen, the new arrivals would also find jobs — usually in the same line which their earlier arrived clansmen were already employed in. Thus, certain sub-ethnic groups tended to concentrate in certain trades and businesses and came to be closely identified with them such as Hakkas with gold mining and agriculture, Hainanese with food and beverage and coffeeshops, and Henghuas with fishing. However, as time went on, and they grew more prosperous, they would branch off into other fields or move out from the area. Some left Sarawak but many decided to stay on. This shophouse still retains its traditional wooden window shutters. 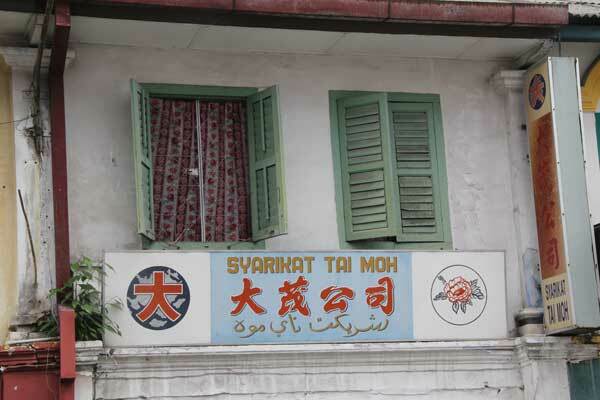 Note also the usage of the Roman alphabet, Chinese writing and Jawi on the shop’s sign. While the museum visit set the overall context for the various topics, it was the actual walk itself which fired the imagination and encouraged interaction. Being locals, sometimes we can’t see the forest for the trees, especially if we are used to taking certain things for granted because we have lived with them our whole life without questioning why they were so. 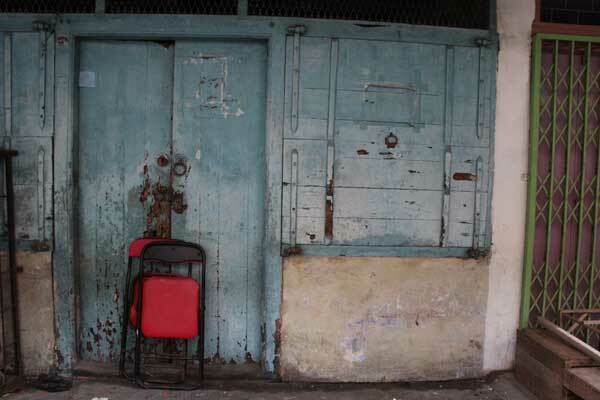 The heritage walk was an opportunity to have a fresh set of eyes to see things hidden in plain sight, or in a new light. With each stop along the walk, Gerarts shared relevant nuggets of information and trivia on how the early Chinese community lived. In some ways, the heritage walk could also have been titled ‘Kuching Chinese History 101’. Several participants remarked they did not know some of the interesting facts Gerarts highlighted about the early Chinese community despite having lived in Kuching for many years — or all their lives. The Hong San Si temple at the corner of Wayang St and Ewe Hai St was one of the earlier stops along the route, and an early example of how familiarity can sometimes blind us to the peculiarities of local history. According to Gerarts, Ewe Hai St was built by prominent local Chinese leader Ong Ewe Hai after the great Kuching fire sometime in 1885 or 1886. He named it after himself but left out his surname out of respect for the Rajah because Ong means King in Hokkien. There is a plaque in the temple saying it existed in 1848 but Gerarts noted the present building is a completely new structure — sadly, nothing of the old temple structure was kept when the building was constructed sometime around 2004 or 2005. Nevertheless, Gerarts noted the present temple could be seen as an example of a typical Hokkien temple with its intricate and elaborate porcelain shard works — called chien nien — along its roof. Craftsmen used pliers to cut out the shapes that they wanted out of unglazed porcelain bowls which they would then glue into beautiful, colourful dragons, deities, phoenixes and other mythical creatures and figures. When compared to tiles, porcelain bowls had the advantage of allowing for finer work to be done, Gerarts said. According to him, the craftsmen who did the porcelain shard work for the Hong San Si temple were very likely brought over to Kuching from the Fujian province in China (the home province where the local Hokkien originated from) as it was unlikely that local Hokkien craftsmen had the knowledge and skills to do it. The unique wooden design and iron-fitting features of the front door and windows of this now unoccupied shoplot used to be a common sight. 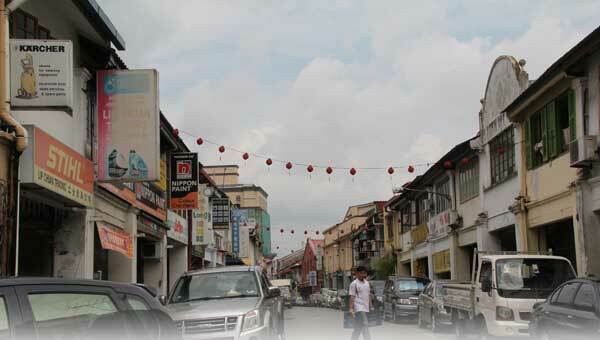 Whether intentionally or not, the heritage walk also highlighted the inevitable change which has come to the area as Kuching city has grown in population and infrastructure. Public and private development projects in the area, particularly the development of the Kuching Waterfront, over the past 20 years have also changed the flow of life in and around Ewe Hai Street and Carpenter Street. Most of the clan houses or associations which were the first touch points for many newly-arrived migrants have moved out of the area into newer and bigger buildings. The Kuching Hainan Association is one of dwindling few which remain in the area. 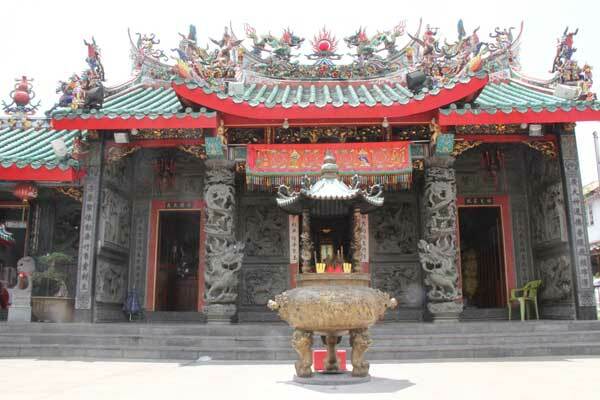 The Hin Ho Bio temple (Temple of the Queen of Heaven), which sits on top of the association’s building was also one of the stops on the heritage walk. While some small family-owned businesses are still operating as they have for generations, others have moved away or have shuttered down even as trendy bistros, backpacker lodges and bars, and souvenir shops have sprung up in their places. This juxtaposition of old and new businesses and renovations only accentuates the feelings of nostalgia as one cannot help but observe how drastically some of the architecture and structure of buildings and layout of areas have been changed in the name of convenience and modernity — and more often than not, discarding the very things which make them unique. For example, Gerarts pointed out that the roofs of certain buildings were shaped a certain way to reflect one of the five feng shui elements — earth, wood, fire, water, or metal. If the owner of the said building was lacking in one of the elements, it was believed that constructing the roofs to reflect a particular element would help to balance out this lack. A few shophouses still retain their unique wooden window shutters but many more have replaced these with aluminium and glass sliding windows. Another increasingly rare architectural feature, which drew a lot of interest from the participants was a small peephole strategically placed in the ceiling which gave people on the first floor a perfect overhead view of who came calling at the front door of the shop without having to go downstairs. Gerarts also took the opportunity to point out some of the shoplots which still retain their original hand-sawn wooden ceilings and beams — some of their roughly hewn surfaces still bearing traces of their original lime whitewash. All too soon, the two-hour walk was over. It ended in front of a private residence whose owner had engaged a historical building conservation consultant to restore the building. It was heartening to see how the consultant had kept as much of the original features, fittings and materials of the building as possible, and remade the rest to keep in line with the historical theme of the building — right down to the unique wooden window shutters and wooden block bolt doors. The Hong San Si temple. Gerarts, who developed the handbook for the heritage walk under FOSM, told thesundaypost it took him about three months to research and compile materials in addition to visiting the area of interest a number of times with subject experts and also to interview local residents. “To do this (become a heritage guide or volunteer), you have to have an interest in the topic and you have to talk to the locals. I had some difficulties because I don’t speak Chinese and many of them, their English is not so good. He hopes locals will take advantage of the free tour to find out more about Chinese roots in Kuching and also perhaps volunteer themselves to be heritage guides. Heritage guides must not only be interested in their topics but also familiar with their specific peculiarities in a cultural and historical context — which differentiates what they do from what general tourist guides normally do, he explained. “To me, the focus of tourist guides are more towards providing a general overview. For example, they know the area, interesting places to sightsee, good places to eat local cuisine, where to buy different items and so on,” Gerarts said. Comparatively, heritage walks can be more immersive experiences due to the more focused nature of the topics, which allows the guide and participants to explore certain areas or sub-topics in more depth. Gerarts said to be a heritage guide, one needed to be able to research and have interest in local history. Where possible, they should also take part in courses specialising in their topics and heritage guiding skills such as what he experienced when he was a volunteer heritage guide in Penang. He cautioned it is crucial to use information from credible sources as not every story which sounds plausible is trustworthy. “People like to hear stories but you must have stories with a basis. Some stories sound nice but have no basis (to support them),” he said. ‘A Stroll Through Kuching’s Chinese History’ heritage walk will run on the first Saturday of each month and is open to both locals and tourists. While the walk is free, prior registration is required as the group size is strictly limited to 15 individuals per group. To register, email [email protected] or SMS 014-9074406. Next Article Wither all the political sloganeering?